Out with the old, in with the new! Just as Venus retrograde stations direct today, Mercury retrograde begins. But before you panic or sigh with disappointment, this cosmic opportunity is actually going to be super helpful. Hear me out. Mercury is the messenger of the gods, ruling over Gemini and Virgo, the two best communicators in the zodiac. In fact, the Roman god Mercury is directly associated with Hermes, the Greek messenger god. Mercury aids in enhancing curiosity, logic, reasoning, creativity, and thought processes. When Mercury goes retrograde, the planet moves differently. It gives an illusion that it is moving backward, and when the planet shifts, the energy of the planet shifts. Since the illusion of it moving backwards is just our perspective, so is the illusion that this cosmic time is negative. What Happens When Its Retrograde? Since Mercury aids in the magic of communication, the way we think, speak, and interpret things gets easily confused. Electronics seem to break, brain fog can cloud you, and little tiffs and inconveniences can happen in relationships and at work. It is a time when everything seems to go wrong. It is by far the most famous planetary time, and for good reason! When we can’t communicate or process our thoughts, feelings, and emotions properly, things are bound to go wonky. What’s So Good About This Particular Mercury Retrograde Period? Venus, the planet of love, beauty, and harmony is back direct today. After 40 long days, all that negative self talk or self-image issues, romantic flare ups, and tricky relationship hurdles are settling down. Take a deep breath and let the dust settle after that whirlwind. How did this show up in your life? Did you make up? Did you break up? Did you break down? Rise up? 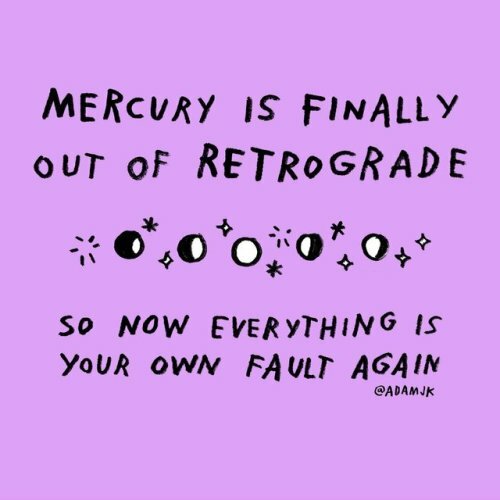 The good news is, this Mercury retrograde is actually here to help you asses that. Yes, you heard me right. This mercury retrograde period is all about thinking about the past, thinking about your judgement calls, your choices and decisions, and seeing if it is working for you. Many people think about Mercury retrograde as a pain, and sometimes there are inconveniences attached. Take note of those set backs — they are usually the first indication that you have to reassess. Since it is in sunny, optimistic, Sagittarius, known for their adventure and quest for truth, get to the bottom of your own truth with a sense of humor and curiosity over judgement. Now is also a good time to own up to your mistakes and make peace with others and with yourself, the ultimate way to achieve harmony. You may also notice people from your past coming out of the woodwork, which can lead to old feelings coming up. This is an opportunity to heal things from the past, practice being present and grounding in the now, and process all that is happening in your life. How Do I Thrive During This Time? Let your mantra during Mercury retrograde be “flow over friction.” If you feel like you are holding on to ideas, outcomes, relationships, contracts, and things of the like too strongly, let it go and see how Mercury is helping you out. If you are noticing friction come up for you, that is Mercury holding your hand and guiding you to your truth. Take a step back and look — this is a gift. Get really clear and asses your boundaries and standards for yourself and others. What are you willing to work with and what is simply unacceptable? How do you want to handle that? And, as always, back up your hard drive, take care of yourself, learn some breathing techniques in case anxiety comes up (mercury rules the nervous system), have patience for yourself and others, and really learn how to embrace faith in your own way. Mercury retrograde is a time to own yourself. You have nothing to worry about, simply honor your thoughts, words, and deeds, and have them come from a place of integrity and love. So, breathe deeply and don’t buy into the drama around this time. Let it be a helping hand to being fully you.